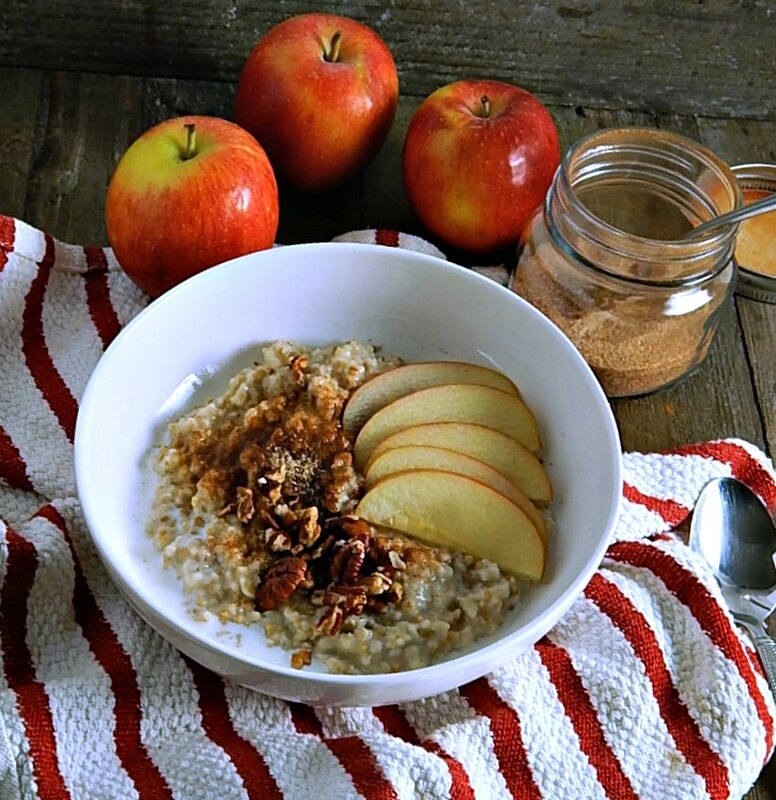 The Instant Pot is the answer to Set it and Forget it Steel Cut Oats, whether you want to set it the night before and wake up to your piping hot oats or just dump your steel cut oats in the pot and come back to it 25 to 30 minutes or up to two hours later. Yeah, you heard me right! Set it and forget it. It’s kind of a teeny little morning miracle and in this day and age with all the problems, all the issues, all the weirdness, it’s kinda nice to have your own little bit of magic to depend on whether you have a busy weekday morning or a lazy weekend brunch kind of morning. Best Instant Pot Steel Cut Oatmeal is a game changer. And there’s no doubt they’re going to up your morning game. They’re creamy, rich, delish and the perfect texture with just a bit of chew. I love how versatile any oatmeal is. You basically have a blank palate to add milk and touch of sugar to if you want or you can go all out and choose any number of flavors. That’s just limited only by your imagination, and you can go sweet or savory. Since it’s full-on fall (40 degrees last night – that snuck up fast!) I went with thinly sliced apple, chopped pecans a sprinkle of cinnamon sugar. But that brings me to another point: if you have time, set up an Oatmeal Bar. Raid the fridge, counter, and pantry and give everyone a few choices. Even if you’re cooking for one or two, don’t be afraid to make up a batch of Best Instant Pot Steel Cut Oatmeal. It’s great for food prep. Pack it in jars or maybe a glass container that has a space for your add-ins so everything isn’t mixed together until you are ready to mix it. Just reheat your oatmeal slowly for a minute in the microwave, then stir in a little water or milk and heat a touch longer. While Best Instant Pot Steel Cut Oatmeal is super simple, sometimes it’s the simplest things that can give us the most angst, right? I tried a couple of recipes and wasn’t completely happy, then I took an afternoon and made steel cut oatmeal several ways until I was happy. More time, less time, soaking, not soaking, more water, less water. Well, you get the idea! Bonus, coming soon, Leftover Oatmeal Cookies, Leftover Oatmeal Muffins and maybe even a couple other leftover oatmeal recipes. (Update. I didn’t care for the cookies I’ve tried so didn’t post them. I have posted the Leftover Oatmeal Muffins. They are a little denser than a normal muffin but very tasty.) I have oatmeal coming out the ears! I froze a bit, too, for a quick breakfast option. See, the standard ratios for Steel Cut Oatmeal and liquid won’t work in the Instant Pot since it’s such a moist environment and there’s no evaporation during the cooking process. I found my perfect ratio is an odd one: 1 cup of oatmeal to 2 3/4’s cup of liquid. Don’t be freaked when you open up that lid and see what looks like a mess of oatmeal and liquid – it’s supposed to be that way. Just give it a gentle stir and it comes together and will actually be rather thick. It turns out that adding more liquid, initially, really won’t make it any creamier (the oats just absorb more water and get softer and mushier) but what does make the oatmeal beautifully creamy is pouring in about a half a cup more water or milk when the oatmeal is finished. It does the trick. I usually make my oatmeal with water and do that final stir with milk, but your oatmeal can be made with 1/2 water and 1/2 milk or almond milk, or if you’re feeling a bit out of the box, 1/2 water, and 1/2 apple juice or cider or all green tea. Don’t go full on with any liquid other than water or green tea – milk or anything else with sugars really has to be cut with water or you’re risking scorching. In the IP that means you’ll get the dreaded burn notice which shuts the pot off, then you’ll have to remove the oatmeal, clean off the bottom of the pan, and re-start the cooking process with more water. The bummer is you’ll just have to guess at how much time to pressure cook that second round of cooking. Usually, I talk about pricing here on most of my posts, but Steel Cut Oatmeal is an item you’ll seldom see on sale. It does tend to be a bit lower in price in late summer and fall when the warehouses are full and the price rises over the winter. I have seen it at Costco but haven’t priced it and I have never looked for it at Aldi, so I apologize I don’t have much else to tell you. Do check the bulk bins at the store and compare to the boxed in the organic and/or cereal areas of the store. Give your oatmeal a sniff when you buy it – the fat content means that Steel Cut oats can go rancid. Store in an airtight container at home for up to two months or freeze. If you’re not all that familiar with Steel Cut Oats as opposed to other oats, you’re not alone. I’ve seen a lot of screwy answers to that question out there on the net! I’m sending you over to the experts, a site I’ve spent time at over the years, OldWays Whole Grain Council. Basically, Steel Cut Oats are groats (the kernel with the inedible husk removed) cut with steel blades so they cook faster. Sometimes Steel Cut is called Irish Oatmeal. The same goes for Scottish Oats, except the groats are usually stone ground rather than cut. Rolled Oats are made from groats, too, only they’re steamed and pressed with rollers to make them cook faster. Instant Oats are just steamed longer and rolled thinner. Add the 2 3/4 cups of liquid to the Instant Pot. Add salt to taste. Slowly sprinkle oats over water. Do not mix. Set the Instant Pot to High Pressure, 4 minutes. When finished allow to go to Keep Warm function for 20 minutes and up to two hours. When finished, open lid, gently stir and then add an addition 1/2 cup of milk or water for creamier oatmeal. Garnish with fruit, dried fruit, nuts, sweetener, and additional milk, if desired. To set for an overnight delay, only use water or green tea as your liquid: Select Manual (pressure cooking) and set to high pressure, 4 minute cooking time. Within 10 seconds, press the timer button. Use the +/- keys to set your delay time. Use your judgment on the salt. Steel Cut Oats can be very dull without a bit of salt. Delayed Cooking works with my Instant Pot Duo60. Your Instant Pot may vary. This entry was posted in Click here for Bargain Meals, Click here for Fabulous Food Posts and tagged Breakfast or Brunch Dish, Instant Pot, Oatmeal. Bookmark the permalink. Just got a IP and like steel cut oats – recipe is a keeper! Mollie, there you go teaching me something again. I never make oatmeal because I’m the only one who eats it, so never thought of refrigerating the leftovers. Also I’ve never thought of making it with a apple juice and water mix. Thanks for the education. Hi Ron, sorry to reply late! And thanks! Nice Mollie – I don’t own an instant pot, but oats is my breakfast choice in the winter time. In the past, I’d always add nuts, raisins and cinnamon, but lately I have been adding fresh fruit like blueberries and peaches to a warm bowl of oatmeal and wow! Love your apple addition too. I’m like you, I eat oatmeal a LOT! Usually, though it’s just rolled oats in the microwave but these are sure good! I do not like rolled oats but I do like an occasional bowl of steel cut oats I have never thought of making them in my instapot. Thanks for the heads up! Hi Anne, it’s the way to go, for sure! No standing at the stove. Although Judi had a good point about using the slow cooker. I think I did try that a couple of times but it’s been years. I have yet to jump on the instant pot bandwagon, but this looks delish! I think it’s a nice tool to have but a lot of it depends on how often you cook at home, too. I think when I was your age I did some cooking but I sure wasn’t the homebody I am now!! Still no Insta Pot for me but I use to make it in one of my slow cookers.I appreciate all of the liquid choices you’ve given – I need to try something different for sure. Thanks for providing the hungry bloggers at Fiesta Friday with a breakfast treat that never will grow old. Thanks again for hosting for us, Judi, and thank you! I do love oatmeal……….your picture is so beautiful. Hi Wendi, and thanks! That made my day! yay! it is my pleasure.